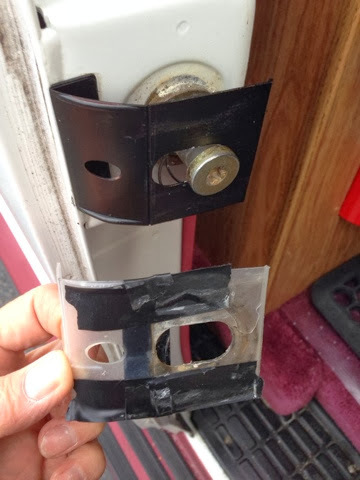 The doors if the camper have a plastic part that goes around the "Nader" pin supported by a spring. Going in and out the side door of the camper I caught my shorts on the plastic tearing it some weeks ago, so when I got to San Diego and went to the dealer for the oil change I ordered the part. I was told it would be in Thirsday that week (it was Tuesday when I ordered it) and the sales agent took my phone number and said they would call me when it came in. Not hearing from them on Thursday I called on Friday and was told they didn't have it but it may be in the shipment that they had received but not unpacked. So the salesman that I was talking to went to the man and asked if he waited on me and he says no. He asks me my name and he could not find the sales order in their system. So he asked what the part was and I discribed it as I did originally and it took 10 minutes to find the number for the part. After he had this he found the sales order. He found that the guy he asked if he had waited on me had actually waited on me and that I needed to go to him for help as the part came in but wasn't on the customer pick up shelf. So now I needed to go work with the guy who blew me and his coworker off and wouldn't look at me in the eye and showed a great deal if indifference towards me. He left and in a while he came back he had the part. Still not looking at me in the eye he hands me the part and says to the other guy that it was in his bin and didn't know why. Like that wouldn't be an easy place to think someone would look in? I was given the part and he says that part is $22 like he couldn't believe it now looking at me in the eye. I told him he quoted $19 the other day. I told him that I thought $19 was too high and how did it go up in price? Apparently feeling bad about the cost he took some off to bring it down to &17. If you look at the part it is a cheap piece of plastic. The old part I held together with electrical tape. This was the poorest customer service on this trip and I wouldn't want to go back to them again. You should post the name of the store so that people who read your blog know not to take their business there. When I was writing the weekly FD Update I had a policy not to discuss who I was talking about when I was writing about customer service. I kind of have the same belief here. I will gladly let people know who it is if asked, just not looking to publicly bash.